Note to Readers: This blog post was co-written by Bruce Booth and Bijan Salehizadeh who co-authored an article in the July 2011 issue of Nature Biotechnology detailing the differences in returns between Life Sciences and IT investing. Most venture capitalists think that Tech investing has been what makes the best returns – which is why they’re pouring money into Facebook, LinkedIn, Twitter, and the like. They may be right now and in the future, but at least over the past decade, they’ve been wrong: in the 2000′s, venture investing in the Life Sciences has outperformed venture investing in Tech. The venture business is now 12 years into a slump in returns that has discouraged even the most enthusiastic investors and limited partners in the space. Yet over the past 18 months, hope has sprung eternal amongst IT and Internet venture investors driven largely by a daily barrage of blog and news headlines covering the exponential growth and dramatic returns prospects of a small handful of social networking and gaming companies. Left behind by this good news is the Life Sciences and Healthcare Venture Capital industry which according to PWCMoneyTree / NVCA data accounted for nearly 30% of the $21 billion invested in venture-backed companies in 2010. A widely held notion amongst GPs, LPs, and entrepreneurs is that Life Sciences/ Healthcare (LS) venture investing is too challenging and has underperformed IT and Internet (Tech) investing over the past decade and will only continue to do so. 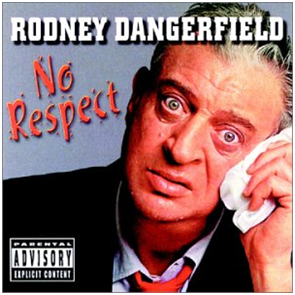 Nothing could be further from the truth – it seems that like Rodney Dangerfield, LS gets no respect. As we outline in our paper in the July issue of Nature Biotechnology, LS venture investing dramatically outperformed Tech venture investing over the past decade. We believe our study is the first widely published, peer-reviewed look at the actual venture returns data for the 2000s comparing Tech and Life Science performance – which we took from the NVCA Benchmarking Database powered by Cambridge Associates. This is the most robust database of its kind – covering returns from nearly 1300 firms over the past 30 years of venture capital. To focus our analysis on actual returns, we looked primarily at companies that achieved first investment and realized an exit in the past decade. Importantly, we looked at the aggregate of individual investments themselves rather than funds since sector-specific and diversified venture funds exist. Our analysis yielded thousands of data points and unearthed two critically important trends that we think are widely misunderstood or unknown by the VC ecosystem, the limited partners in the asset class, and the media that covers it. Overall Life Sciences/Healthcare venture realized gross pooled mean IRR was 15.0% for the past decade. This is in contrast to 5.5% for all of venture capital, 3.0% for IT and 4.1% for Software. In fact, every single sub-category of Life Sciences venture showed at least 2x to 3x better realized IRR than IT counterparts. Including unrealized exits (value of currently active deals) makes the difference less profound, but the outperformance of LS still persists. (For definitions: “realized” deals are exits, “pooled” data is the aggregate of the full decade into one dataset, “means” are arithmetic means, and “gross” returns are not net of the fees or incentive compensation). There’s a perception that lots of Life Sciences deals lose money. It’s true. 58% returned less than their invested capital. But surprisingly the failure rate in IT companies is much higher: almost 75% of IT-related investments realized a return of 1x or less in the past decade. 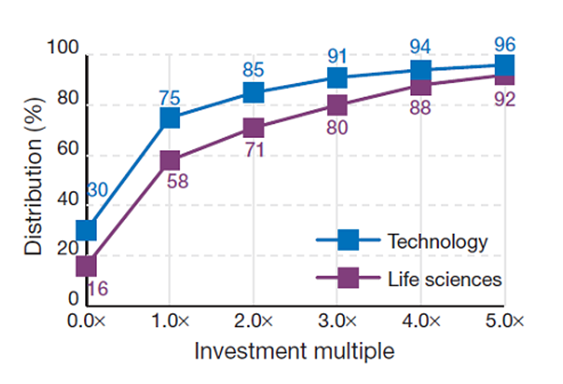 Furthermore, the frequency of 5x or greater returns are higher in Life Sciences – 8% vs. 4% for IT. We’re sure the Tech distribution curve extends much further out at the top end, but the dataset didn’t allow for that analysis (e.g.,. top 1% of Tech deals almost certainly have higher multiples than LS). We would bet that only a small percentage of GPs and LPs in venture capital actually are aware of this outperformance of Life Sciences in the past decade, and think that more transparency around the actual returns data in the venture industry is a good thing. Nearly 60% of Life Sciences IPOs from the past 4 years are trading below their issue price versus ~30% of tech IPOs.. And, post-IPO performance has been dramatically better in IT than it has been in Life Sciences. IT companies that get public tend to be more mature business with revenues and often significant earnings; in biotech, most companies remain cash-burning for the foreseeable future. This difference in IPO results is important and is a big part of the negative perception of the sector. IPOs are media darlings, and help create buzz about sectors. In LS, we aren’t likely to have that type of buzz anytime soon. Our data and analysis of course has some short-comings. First, it is a look backwards over the past decade and does not include returns from the recent 2011 class of tech IPOs which will surely improve IT returns, perhaps significantly. However, it has been shown by others that the recent web high flyers are mostly concentrated in the portfolios of a small group of venture firms, so it may have a less profound impact on the overall tech landscape. 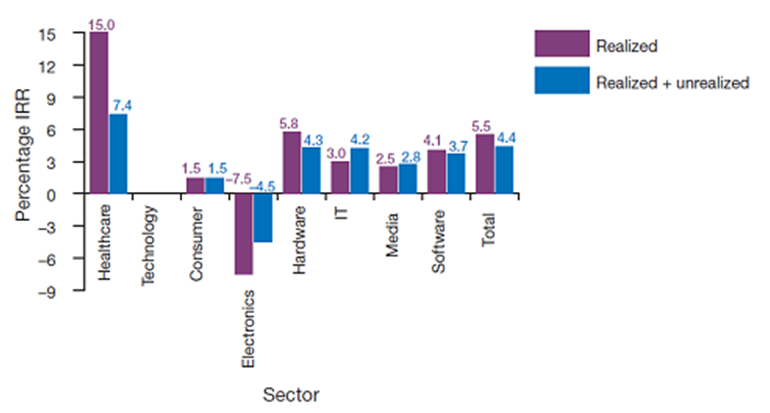 Why this data different than the quarterly benchmark data by sector that Cambridge Associates publishes? A few reasons for this. First, the quarterly published Cambridge Associates data combines realized and unrealized returns; the biggest differences noted in our analysis are in the realized exits. Second, our analysis is for US VCs’ investments into US companies. We believe that Cambridge includes US VC firm investments into all companies (including companies housed outside the US). Adding international investments by US firms, especially recently from China, does improve the unrealized and realized venture returns in all sectors but particularly Tech. Third, and most importantly, we pooled 2000-2010 together to eliminate vintage year anomalies that the quarterly Cambridge data can show when looking at individual vintage years. This pooling clearly weights the analysis towards years with more financings higher than those years with fewer financings. Complexity – Healthcare and biotech in particular is inherently complex and investing in venture stage companies in this space requires a blend of deep science and medical understanding, plus a strong stomach to withstand the ups and downs of product development. It’s not revenues and margins, but long term value creation. And it’s getting more complex – headlines around tightening regulations at the FDA, the impact of health reform, and reimbursement cuts at Medicare can be scary if not put in proper context. It’s the cycle, stupid – 10 to 12 years ago during a prior IT bubble period, there was lots of talk about how lackluster an investment area healthcare was relative to IT. In fact several high profile firms ditched their healthcare practices during that time. A lot of that talk seems to have made a comeback in recent months driven by perception that healthcare is a laggard. Déjà vu. No 100x’ers – Unlike IT where 100x returns are possible and have driven great outcomes in companies like Skype and Google, and will most likely in Zynga and Facebook, Life Sciences never will have these wild “Black Swan” outliers.. These 100x’ers are the companies that draw press attention, new talent, and more capital into the IT space. It takes money to get to an answer – healthcare companies usually require more money to get to an answer than IT (particularly internet) companies. The dogma in IT VC these days is that funding lean start-ups is the right way to go. Despite exciting new efforts at Atlas and a few other firms to build asset-light bio-pharma companies, it will never be as capital efficient to develop a drug, a diagnostic, or a new medical device as it is to build a mobile app or a web service. Poor marketing – Our IT brethren are much savvier marketers, promoting their new investments, and getting glowing pieces about their latest and greatest new investments into mainstream media. Not so in healthcare where only a small handful of VCs and even a smaller group of CEOs use social media or leverage the press effectively. And, of course, most Life Sciences companies don’t translate well to widely read press outlets from Forbes to TechCrunch. In conclusion, we think that IT and Life Sciences venture investing are fundamentally different businesses. But these sectors actually complement each other quite well within a single venture portfolio providing much needed diversification within the asset class. Tech venture investing is all about the hunt for the Black Swan: it’s about getting a high market-share of top quality deal flow, working with only the best syndicates. Placing many small seed-stage bets creates optionality, and allows firms to double-down on those achieving real scalability and market traction. Step-ups in valuation between rounds occur with regular frequency in winning companies and the tantalizing possibility of a 100x in a short period of time is always there when you invest in an early stage company. Life Sciences on the other hand has been a steadier business, with a lower failure rate and a higher frequency of 5x+ returns. Because of the nature of the LS venture market and the capital intensity in biotech, differential venture performance is not really about market share of new deal flow, as most syndicate formation isn’t competitive. It’s about thoughtful scientific and clinical risk assessment, coupled with disciplined titration of capital and active governance, and can lead to very attractive investments over time. To get all of the numbers and the full commentary, please head over to the Nature website. For simplicity’s sake, in this post, we use the term Life Sciences to cover all of Healthcare venture capital investing and the term IT to cover all IT/Internet/Software and Hardware related categories.